Mirabelle Bevan swept into the office of McGuigan & McGuigan Debt Recovery at nine on the dot. She removed her jacket and popped the gold aviator sunglasses she’d been wearing into her handbag, which she closed with a decisive click. The musky scent of expensive perfume spiced the air — the kind that only a sleek, middle-aged woman could hope to carry off. Bill Turpin arrived in her wake. Like Mirabelle, Bill was always punctual. He was a sandy-haired, reliable kind of fellow. At his heel was the black spaniel the office had acquired the year before. Panther nuzzled Mirabelle’s knees, his tail wagging. “Tea, Bill?” Mirabelle offered without looking up. — Like historical mysteries? Her Mirabelle Bevan series features a woman who has suffered tremendous loss — as has her country. Together, she and England are coming out of the despair of the Second World War. Oh, and Mirabelle is solving murders along the way. — Prefer contemporary fiction? From Hong Kong call girls to a mysterious inheritance, road trips and revenge, Sara writes it all. — Historical epics? From China to Antarctica, Brazil, England, and the Arabian desert, Sara sweeps you across the world. — Nonfiction your thing? She wrote the companion guide to the ITV series, Victoria, and is currently writing about Scottish women in history. As she herself has been inducted into the Saltire Society‘s community of Outstanding Women, I think that’s highly appropriate. — Let’s not forget blog posts. Here is one of my favorite of hers, on the anniversary of UK women getting the right to vote. It’s on the site of Sara’s own Reek Perfume, a company she runs with her daughter, so if you have a weakness for fabulous scent, well, you can thank me later. Sara is so busy writing, she mentions that she needs to deliberately carve out specific times to read. Go-to favorites are Scottish novelist and screenwriter, Lorna Moon, TC Boyle, Jeremy Levin, Susan Ferrier, and of course Agatha Christie. We also talk about the Windrush generation and the problems they’re currently facing; anyone interested in learning more can check out this BBC overview. 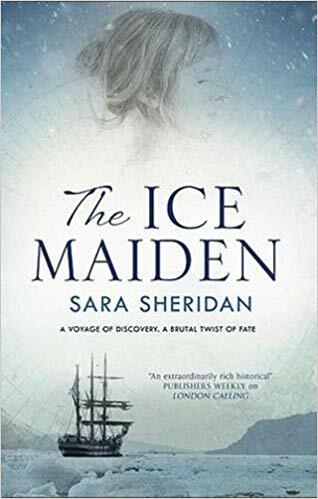 Sara and I chat about her most recent novel, The Ice Maiden, and if you’re in the UK, you’re in luck! Today is the launch date! Yay! Go read. Alas, American listeners will have to be a little more patient; we don’t get The Ice Maiden until November, 2018, but you can preorder here. As always, if you’d prefer to read our chat rather than listen, the transcript is below. Enjoy! 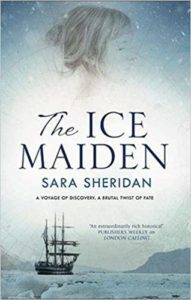 Laura Brennan: Author Sara Sheridan brings history to life in novels such as On Starlit Seas and her upcoming historical epic set in Antarctica, The Ice Maiden, which will be out in the US this July. It’s a romance and an adventure — but where there’s life there’s also murder… Her Mirabelle Bevan mysteries, set in post-WWII Brighton, feature a woman whose skills were honed during the war and who finds herself at loose ends now that there’s peace. Lucky for us, evil lurks everywhere — even in Brighton. Sara, thank you for joining me. Sara Sheridan: It’s nice to chat to you. LB: So you write the wonderful Mirabelle Bevan historical mystery series, which we’re going to talk about, but you also write prolifically in other genres. SS: Yes, I do. I find it really stimulating, actually, to write in other genres. I know some writers find it really confusing, but for me, if I finish writing a 1950s Mirabelle and then I go on to a children’s book or an historical, another historical in a different period, that’s just a rest from writing about the 1950s. And so I find it really stimulating. It allows me to write all the time. I’m just drawn to stories I suppose. I’ll find a story and I’ll think, “Oh, I’ve got to write that one!” And it goes down my list and that’s it, I’m off. LB: Your historical fiction is based on the lives of real-life explorers. SS: Yes, the historical adventure series is. We had this crazy period in British history where the Empire kind of took off. And there was this genre of person who kind of make no sense today, who said, “Oh, we haven’t mapped the Niger. I’ll take some buttons and some sandwiches and a few soldiers, and I’ll just go off and map the Niger. Don’t worry about me. I’ll be back in a few years.” And they went off in these incredibly dangerous conditions to go to do whatever it was. The first person in the series I wrote about was a guy called Robert Fortune, who went into China in 1842 on an industrial espionage mission to try to figure out how the Chinese were producing tea for the East India Company, so that they could replicate that process in their Himalayan tea plantations. It was an insane mission. It was a capital offense for a European to be inside China at that time. And off he went. He disappeared. Everyone thought he was dead. He was gone for three years. And he came out on the other side of China with thousands of tea plants and several tea gardeners and sailed them all to India where they helped to set up these tea plantations in the Himalayas. And I go nowhere without checking everything out on street maps. So the idea of these people who would just set off without even a map, without knowing what was there, on these incredible adventures, I just find incredibly inspiring. And I also view it as an opportunity to include women’s history, to look at the stories of the women. Because we’re terrible, terrible at memorializing women and crediting women with what they did. Very often, in these very male, testosterone-fueled stories there’s a lot of women who pitched in. So I like to look in the archives and see if I can just find a little whisper, little echo of these women and then use the book as an opportunity to bring those stories to life. LB: How did you get started writing professionally? So I quit my job. This, by the way, is terrible advice. Do not do this. If you’re listening, and you’re considering, don’t do this. It really shouldn’t have worked. But I quit my job, and I thought to myself — because I was a senior administrator, so I was very organized. I still am very organized — a novel is 70,000 words long. If I write 5000 words a week for 14 weeks, I’ll have a novel and that will be grand, I thought to myself. So I did. I quit work, I had very little savings, but that’s what we were living on. I spent 14 weeks writing a book. My first book was a contemporary commercial fiction book called Truth or Dare, and I sent it off to 96 publishers at the same time. Again, terrible thing to do, don’t do that. And within three weeks I had my first offer. It went into the Top 50 that book and was nominated for the Saltire Prize. So just really, really lucky. I tried something and it worked pretty well, pretty quickly. And I thought, well, maybe this is something I can do. LB: Okay, you may not be able to read a map, but you are an adventurer. SS: [Laughter] Well, thank you. It was kind of crazy. It really shouldn’t have worked, and I feel terribly guilty. I go to book festivals and get asked that kind of question and I think, oh my goodness! All these people in the audience, lots of people who come to book festivals want to write and they’ve been writing a novel for five years or 10 years or something. And I was just what we call in Scotland, “jammy.” I was jammy. I’m so lucky. I have continued, actually, to be lucky in finding places for my books with different publishers, because they’re all in different genres of course, so it’s a bit of a juggling act. LB: So tell me a little bit about how the Mirabelle Bevan series developed. Am I right in thinking that it started out as a present to your father? SS: Yes, it was a short story. My father was brought up in the ’40s and ’50s in Brighton and London, and so this was his world. And my father, he’s a really fascinating character actually. He’s brilliant with artifacts. My dad was an antique dealer and he can recognize an object that he saw 20, 30, 40 years ago. You’ll be at an auction with dad — he looks a bit like Omar Sharif. He sort of stands up in the back, bidding very discreetly. And when you go mark that sale with him, he will say, “I noticed that teapot,” he’ll say. “That silver teapot, the Delamere teapot. Harry Parry but that teapot in 1963 in Birmingham. He paid 2 pounds, 10 shillings and thruppence. There’s a mark on the underside, they won’t have been able to buff that out.” And right enough, you turn it over and there’s a mark on the underside. He’s amazing with objects. He can remember diamonds, for heaven’s sake. But he’s not so good with people. So after lunch I was walking home, in the sunshine, and I remember thinking, for his birthday I will write him a short story about this woman. 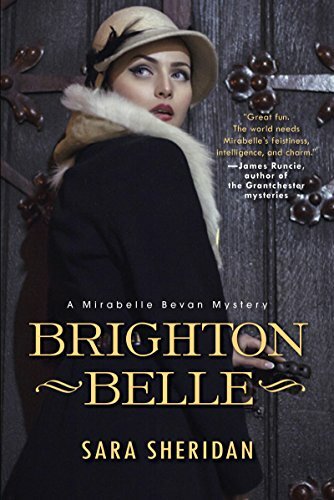 And of course that short story is now the beginning of Brighton Belle, which is the first Mirabelle Bevan mystery. It sort of grew like Topsy, unexpectedly really, but it was such good fun to write. And it gave me a real connection to the world that both my parents grew up in. Their kind of era, when they met; they met later in the ’50s at a tennis party in Edinburgh. And just that world that was postwar and very hopeful and very practical. I wanted to incorporate the feeling of their youth, really. So that’s where it came from. LB: One of the things I like about Mirabelle, your heroine, is that she isn’t someone in the first blush of youth. There are so many stories about a woman, she’s always 26 or 27. But Mirabelle is a woman who has lived. SS: Yes, well, she’s 37 in Brighton Belle, she’s 37, that’s her age. In the ’50s, 37 if you weren’t married was really on the shelf. You were really very much past it. So she’s kind of given up on life. She’s had this terrible war, troublesome war, she’s lost the love of her life after the war in very unfair circumstances and she’s been left on her own in this slightly dead-end job where she’s just working to live. But she’s got no kind of passion for anything. She’s a bit depressed, and a bit gray really. A bit like postwar Britain, a bit like Britain was in 1951. It just couldn’t have been a young person for me. I had a hilarious, somebody got in touch with me on Facebook who had recently read some of the books. And she said, well, you know your character is going to be far too old for too soon, she said. If you keep writing one book a year, you’ll run out. And I was thinking, no. Mirabelle is going to go ahead and she’s going to be a Miss Marple at 80. She’ll still be doing some knitting and sorting out various mysteries that fall into her lap one way or the other. But she needs that experience. I mean, she’s not a rookie. She’s got a lot of experience, even if she doesn’t always realize that she has that experience. And that’s part of the character that I was really wanted to write, someone who had a past. And of course if you’re 24, you probably don’t have a past yet. LB: And the past is actually one of the themes that I noticed in the novels, the idea that a past really has a hold on people. SS: It’s that trauma. If you’ve lost somebody, if you are bereaved, and you’ve been through the war. In that war, everybody lost somebody. People lost their family, they lost friends, the lost acquaintances; people were scarred. And if you look at the Pathe newsreels of that era or interviews and read the newspapers, people had this really, really tough time and they carried it with them. You carry that with you for a long time if somebody you love dies. And if more than one person you care about dies, then it’s even more traumatic. So I suppose, in a way, in the beginning of the series, she’s slightly depressed. In modern terms, we’d probably diagnose her as having post-traumatic stress disorder and being slightly depressed. And in a way the series is an effort to cheer her up. She goes from Brighton Belle and in each book, each book is a little bit closer towards her recovery and her getting her love of life and her zest for life back. LB: There’s also the tension between the way things were — and there are some people who very much always want things to be the way they were — and the fact that change is in the air. SS: Well, the war was exciting. I mean, there’s no question of that. Actually, after the war, there was a whole syndrome, World War II, of guys who actually been in battle and particularly pilots who had done these incredibly dangerous missions with terrible odds of survival and come through almost as adrenaline junkies. And during the ’50s, if you look through newspaper reports, there’s a huge amount of these pilots that then die in car crashes or playing Russian roulette or doing all kinds of crazy things. It’s almost like they couldn’t let the adrenaline go. So there’s that kind of syndrome going on as well. And you see in almost all the books, there’s one character who really hasn’t quite let go of the war and that excitement, that glory. LB: Kensington has started releasing the series here in the US. They just recently issued England Expects, which you built around an actual Brighton scandal from the 1950s. SS: Yes, I love a good scandal. What I try to do with each book, because each book represents a year; Brighton Belle is ’51, and London Calling is ’52, and England Expects is ’53, and then they go on. I’ve actually written eight, although they’re not all out in the UK yet. We’re doing number six in the UK this year and you guys are getting number three, England Expects. So I try to capture the spirit of that year. And I look very carefully at everything that went on that year, including things that were scandals or things that were in the news, or even the colors. Fashion colors were much more dictated in the ’50s. If red was the fashion that season, pretty much everything in the shops would be red or purple or whatever it was. So I try to pick up on those kinds of things to really get a flavor of what that year was like. Because that thing about Mirabelle cheering up is actually true of the country. The country was cheering up slowly but surely during the ’50s. I’m a bit of history junkie really, and I want to create a kind of memorial almost to what that year was like on the south coast of England. LB: One of the things you talk about is — an inspiration for you — is Agatha Christie. Because most people today think of her as very soft, very cozy, but you look at something like And Then There Were None, or even The Murder of Roger Ackroyd, those books — there’s a hard edge to them. SS: What is that about? Christie is so dark! She’s so dark. And she was very edgy in her day as well. I think because some of the themes that she talks about are much more normalized. So she has, for example, gay characters, which of course in the ’50s everybody would be like, “Oh!” That was really shocking, that was really edgy. Whereas today it’s not really a big deal. Or divorced characters, you know, “Oh! The character’s divorced!” And so for her original audience, which was the contemporary audience. These weren’t historical books in their day, they were contemporary crime books. Many of the things that were actually shocking, are shocking for us anymore. And I think that’s led some people to believe that the books are somehow soft or they’re quite cozy. Actually, much of what happens is really horrific. It is quite interesting that there’s been a flip in standards. So while we’re all cool with divorce and it’s fine to be gay now, actually when you look back on attitudes towards, you know, racist attitudes or sexist attitudes that are contained in the books, that’s what’s actually shocking to a modern-day audience. And for me that’s part of the challenge, I suppose, thinking how do I take the traditional crime genre which is slightly — it’s got a reputation for being more cozy or more gentle — and create that edge that Christie had for a modern reader. And so I’ve created a sidekick for Mirabelle, Vesta, who’s a black girl from South London, from Bermondsey, who is a complete foil for Mirabelle. She’s much younger, she’s much more optimistic, she doesn’t really remember the war, she was too young, she just has kind of nice memories of it. And I wanted to bring in the terrible attitudes, the horrible attitudes towards Vesta the people would’ve had as a way of bringing an edge to a modern audience. LB: You have someone ask Vesta where she’s from, and the idea is, they want to hear Jamaica, they want to hear someplace exotic. And that just happened with Prince Charles when he asked someone where they were from because their skin color was brown. SS: Yes, it’s tricky with us. And at the moment, we have a huge political scandal over here because the conservative party here in government are trying to deport many of the Windrush generation, who are the Commonwealth citizens from Jamaica and all the Caribbean countries who came to the UK during ’50s Vesta’s family actually predate the Windrush generation. But there are lots of characters in the book, Vesta’s friends or people that she knows, who would be part of that generation. So it’s amazing how in writing about the past, you’re still in some way, I suppose, writing about today. 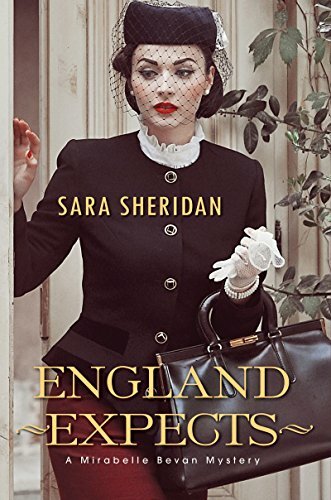 It was really cool as well to read England Expects again, because they send me the American editions, which drive me crazy because I’m a spelling nut and of course my spelling is English spelling and you guys spell things differently. So it blows my mind when they send me the proofs and I have to try to figure out what’s American spelling. Anyway, but I read it again just before comes out in the States, and I hadn’t read England Expects for ages, and I read it through. And of course I’d forgotten some of the little details. I was like, ooh, that’s good. Ooh, I wonder what’s going to happen here. I was getting quite drawn into it, and I thought, oh well, I’ve done an okay job then. LB: Well, it’s very exciting. It’s being adapted for television? SS: Yes, it is. They’re trying to find a screenwriter at the moment in London, it’s a London-based production company that have picked it up. Occasionally they phone me up and we have a chat about things. And I’m running at the moment, in my diary, at the back of the diary a list of possible actresses which I can’t tell anyone, because if someone else gets it and the people I think want to get it, that would just be awful. We have to keep our manners intact. But it’s quite exciting to think how it might be adapted for the screen. And that’s not my skill. So it’s going to be really interesting, I think, working with a screenwriter as they take those characters and adapt them for a different medium. LB: You talk about the racism and the sexism; there are a lot of things that were very different back then, especially for women. You dive right into that. SS: Oh, yes, I love that! That’s brilliant. My friend and I went few some Pathe newsreels, you know these old newsreels from the ’50s? He was writing a nonfiction book about the ’50s. We got into this archive and we sat together and watched the screening of men talking about women in the ’50s. We both work sometimes for the BBC, we do interviews and things at the BBC. At the BBC there are 16 words that you are not allowed to use, all the bad words, and they switch you off if you use any of those words. And so me and my friend were sitting there, and this guy, I swear, says all 16 words in about two sentences. And we both kind of stopped and looked at each other and we were like, we’re going to run that back. Because it was just so shocking. Just the misogyny, the everyday sexism of it. It’s quite enraging, and it’s also quite good fun to write it in, things that you wouldn’t write in a modern book because it doesn’t just happen in exactly the same way. So I’ve had quite good fun letting Vesta and Mirabelle stand up to these things in a slightly 1950s kind of way. Yes, I mean, I’m a huge feminist. I also, as well as writing, I run a beauty company, a beauty brand called Reek Perfume, which is like a feminist perfume company where we memorialize women through scent. And we stand up a bit to the way that the media represents women’s bodies. We have a no retouching policy with all of our models, and we also use old models and young models and all different sizes and everything you can think of at Reek. And so I have a real passion for women and women’s rights. It’s huge for me. So those passages are actually great fun for me to write. I also think there’s a thing — you know, one of my friends has recently been writing a series and she’s decided to call it a feminist murder mystery series. And she said to me, “You know, Mirabelle is a feminist. Why did you never say it’s a feminist murder mystery series?” I just think, for me, I would feel like I was imposing something on the reader. I was saying, you have to read this as a feminist. Whereas I’d much rather take the reader’s hand and go, oh, look, a dead body! And, oh, what’s that clue? Oh, a postmodern feminist dilemma. Well, what’s she going to do about that? And bring people along through story. LB: So many modern, contemporary stories set today have women who are police officers and the detectives. And you hinted that. You’re like, well this is going to come. And you have all these police officers who are going, well, I’m leaving the force as soon as that does. SS: They don’t like the idea of it. Or they think that the women will just be doing lost children on Brighton Beach. They don’t mind the women doing lost children on Brighton Beach, that’s fine if they have WPCs, that’s what they’ll go and do. I look at my mother’s generation, actually my grandmother’s, and I think, my god, those women changed the world. They really did. I love her! She was just a housewife, my mother didn’t have a job or anything like that, but my mother change the world. She changed my world. When you understand that that has happened, you turn it around immediately and the question is of course, what am I going to do? What am I going to do for my kids that’s going to make things possible for them that aren’t possible for me? And so I think the ’50s was a really important decade in my history, even though I wasn’t alive. It’s really important to understand that era of just before you landed on the planet, if you like. Because in a sense, it’s where you come from. It’s the era that your parents were struggling against. History, for me, is very much about today and learning where we are from and also dreaming a little bit about where we can go. LB: Well, one of the things that I love is, I grew up in the same time you did, and I always noticed the trucks and signs were always ‘So-and-So and Sons,’ ‘So-and-So and Son.’ You’ve gone into business with your daughter. SS: Yes, Molly and I run Reek together. It’s brilliant, I love it. I’ve actually been doing quite a lot of research as well. I’m writing a nonfiction book at the moment about Scottish women’s history, and I’ve discovered a whole load of Scottish businesswomen in the 15th, 16th, 17th centuries. And in the 18th and 19th centuries, female ironmongers in Glasgow, 50 miles from where I live. So I think there were women’s businesses, but we are very good at forgetting. One of the things I’ve realized, actually, in researching this book is that quite often you’ll think, oh that person was the first person to… And they thought they were the first person to, they thought they were the first woman in business or the first female nurse or the first whatever. But actually, when you go back to history, it’s just that we’ve forgotten. There were a lot of very wealthy medieval women who knocked their husbands out of the park. They inherited their husband’s business when the husband died and they grew it. They were tycoons, they were amazing. But we don’t hear about them. And if we don’t have those role models, how are we supposed to know it’s possible? So you’re breaking new ground every time you do something, even though you’re not really a pioneer. So that’s really important for me. Molly and I work together at Reek and she’s amazing. I’m a words person, obviously, and a concepts person and she is very visual. She’s a makeup artist, an art director. And so it’s quite interesting getting the two of our creativities together, and I’ll come up with all the words for something and the concept for something, and then she’ll feed the images into that. I’ve been really impressed, actually, working with her. She has a pretty amazing eye, I have to say. Because I’m not really, that’s not my skill. LB: You have a new book out in July. The Ice Maiden. SS: Yes. The Ice Maiden is one of the earlier series, the adventures, and it’s based around the expedition, 1842 expedition, British expedition to Antarctica by guy called James Clark Ross. And what they did was map the exterior of the continent. They didn’t go inside at all. And these were the maps that many of the Antarctic explorers used at the beginning of the 20th century. So when Robert Falcon Scott and Amundsen went down to try to reach the Pole, they were using James Clark Ross’ maps, which he made over three Antarctic summers in the 1840s. And I was fascinated by this idea. I mean, imagine going somewhere and not even really setting foot on it in order to make a map of the exterior. The only time they seem to have set foot on it is, they go on to the ice to plant a British flag. So I began to think about the women in that scenario, and of course there were very few women at the Antarctic. The first women to actually set foot on it were early 20th century women who went with their husbands. And I thought, well what if there was a stowaway? What if there was a stowaway who was a woman and she was there by accident and nobody wrote her down, nobody said that she had been there. And so I started to play with that idea, and of course she became the ice maiden of the story. It was fascinating. I loved working, I did a lot of — I’m a bit of a nerd, and I spent a lot of time at the Antarctic archive at the Scott Polar Institute in Cambridge, just reading through many of the original documents and looking at a lot of the equipment and coming up with this slightly fanciful story which I loved writing. I actually wrote it in bed. I wasn’t very well, and one of the things I could do was sit in bed and write. So I wrote this entire book sitting in bed recuperating from having not been well. SS: We didn’t sell it for ages because it’s slightly unusual. And my agent just said, I’m putting this in the cupboard, I’m not worrying about it. And then she phoned me earlier this year, we only sold it in January and I’d written it about three years ago. And she said, you’ll never guess what! I’ve met this woman who wants to buy your book. And I was like, no way! Because we’d sold so many other books in the interim. Because when my agent had shown it to lots of people, lots of publishers, they had said, oh, it’s kind of historical but it’s sort of a bit spiritual, and there are various other things and it, I just don’t know where to put this on the bookshelf. Anyway, Jenny, my agent, who is brilliant and never gives up had bumped into this editor who said, “I’m looking for something a bit wacky.” She said, “Oh, I’ve got the very thing!” And the editor read it and bought it within a couple of days, had bought the book. And she said she thinks it’s like an historical Lovely Bones. SS: Yes! And I thought, yes, it is actually, I hadn’t realized that. So I’m quite excited to see what readers think of it. It’s going to be fun for me. Because you don’t know. You do this on your own, completely on your own, and the only people who read it are you and maybe one or two editors, that’s it. So it’s like four of you who know what the story is, and then you’re like, hmmm… What is everyone else going to think? LB: So who do you read for fun? SS: I can’t write and read at the same time. So what I find is, I will take a couple of months a year, maybe six weeks twice a year, and I read like crazy. I read like a ravenous beast. Because I haven’t been able to read fiction. I read a lot of historical writers, particularly American writers that I like. Jeremy Levin, I like T.C. Boyle. I’ve been rediscovering some Scottish writers. There’s a writer called Lorna Moon who wrote short stories and a novel in the early part of the 20th century and then went on to become a screenwriter in Hollywood. She wrote silent movies and was really, really successful. She had an affair with Cecil B. DeMille’s brother and had a child by him and died very young, I think she died when she was in her early 30s. And I’ve been reading her recently. Her modulation, if you’re a bit of a story nerd, is absolutely extraordinary. I think they’re among the best short stories I’ve ever read. So I really like Lorna’s work. Susan Ferrier, a Scottish novelist in the Victorian era. I just like stories, so I don’t stick to particular genre. I’ll just wait for story to hook me in. And I have no patience. This is a terrible thing to admit, but if I’m 30 pages in and I think, do you know what? I’ve only got my six weeks, so if I’m not loving it, if it doesn’t grab me and speak to me, I just set them aside. I’m a bit ruthless. LB: You are very organized. SS: I am. I mean, I have two books out this year, I have a Mirabelle out in the UK and The Ice Maiden is coming out, and next year I have three books out. Molly and I, my daughter, have actually written a children’s book together about the Loch Ness monster. And that’s coming next year as well as another Mirabelle in the book I’m writing at the moment, the nonfiction book. So you have to be organized if you’re going to produce enough words to keep publishing 1, 2, 3 books a year and run a business on top of that. So yes, I am pretty organized I’m afraid. It’s one of my magical superpowers. LB: Well, I don’t think that we can keep up with you, but if we want to try, where can people find you online? SS: I am on Twitter @SaraSheridan. I’m on Facebook, not brilliant Facebook, but I’m SaraSheridanWriter and I do check it myself, nobody else runs it. It’s just me, but I am sometimes a bit slow. And I have a website: www.sarasheridan.com where I pop up articles that I’ve written and notices of events that I’m doing. Although sadly I’m not coming to America any time soon. But I have my fingers crossed. I have a dream that I will come over to America and do an amazing road trip. So at some point, I’m hoping I’ll be able to come and visit you. LB: That would be just lovely. Sara, thank you so much for joining me today.